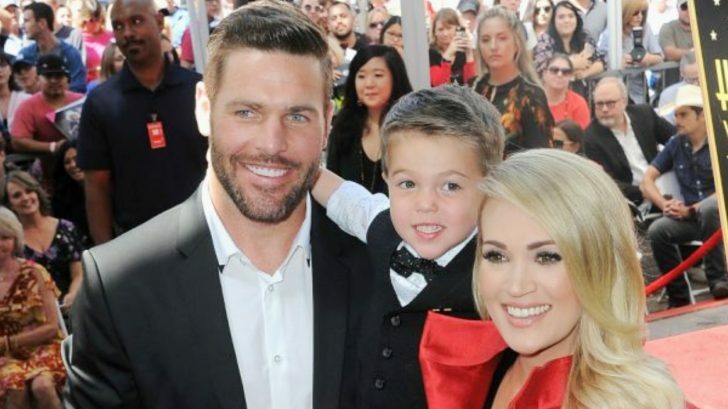 Carrie Underwood and Mike Fisher‘s four-year-old son Isaiah has quite the personality. As Carrie has said before, her eldest son is quite the ham, and often says and does things that make his parents laugh. For example, back in October, Carrie took to Twitter to share a hilarious conversation she had with Isaiah. She caught her son starring at her, and when she asked why he was doing that, he said it was because he hadn’t looked at her in months! Just caught the kiddo staring at me. Isaiah: I’m just looking at you. Isaiah: I just want to look at you. I haven’t looked at you in months. A few months before that, Carrie took to Instagram to share that her son’s imagination was prompting him to play with an unusual toy. In fact, it wasn’t a toy at all…it was a potato! What made Isaiah’s toy choice all the more comical is the fact that he was playing with the potato for two days. And, for whatever reason, he decided to set it up inside an inflatable doughnut. “Yes, I know it’s weird,” Carrie wrote in the caption, noting that her son does have real toys. Isaiah doesn’t reserve his hilarious antics for only his mother and no one else. He also acts like a goofball around his father, something he showcased when the two of them attended a Predators game in Bridgestone Arena. Mike, a former NHL player who retired from the Predators, was invited to attend one of the team’s games to receive a special honor. He brought Isaiah along, who was given the chance to drop the ceremonial first puck to kick things off. Isaiah could be seen cheesing at the camera for photos, before dropping the puck and then quickly running off the ice into the crowd. His silly antics charmed everyone who was watching! More recently, it was Mike who caught Isaiah doing something unusual, but hilarious. Only this time he wasn’t playing with potatoes or telling his mama how he hadn’t looked at her in weeks. Instead, he was sleeping in one of the most random locations a little boy could ever sleep! 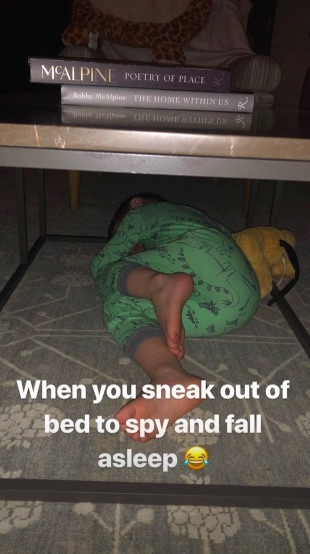 As Mike shared on his Instagram Story, Isaiah had decided to sneak out of bed to spy on his parents and baby brother Jacob. But within minutes of climbing out of bed, the little guy got too tired to stay awake, and drifted off under the living room coffee table. Mike posted a photo of Isaiah’s strange snoozing spot, which shows him all dressed up in a matching pajama set, snuggled up next to what appears to be a Pluto plush under the coffee table. Hey, when you’re tired, you gotta make do with what you’ve got, right? Isaiah’s makeshift bed doesn’t look comfortable to us, but apparently it was perfectly fine for him! The little guy is going to need all the rest he can get. A busy season is coming up for his family, with his mama’s tour kicking of in May and a string of awards shows coming. There’s also the CMA Fest this summer, which his mama will be performing at. Last year, Isaiah took it upon himself to greet the many visitors that flocked into Music City for the multi-day festival. Of course, Carrie had to share the video of him welcoming everyone who walked by. Check out that adorable clip below!